The figures on agency use rise year on year, across all areas of the NHS, and regardless of whatever party is in power. The public, the media, and the unions are all outraged at the cost and alleged drain on NHS resources. First of all, it always infuriates me when the media use the term ‘waste’. It is not money that is simply thrown away - it is being spent on ‘patient care’. The work and care that agency nurses’ deliver is valuable work, and should not be dismissed as a ‘waste’. Furthermore, it is interesting that the free-market, tory-faced politicians are all for opening up healthcare to ‘the market’ when a pin-stripe suited, private mental health provider, is demanding up to £10,000 a week for one patient, but when supposed excessive amounts of money may be going to a nurse, it is somehow unacceptable…. Sounds like the free market for some, but not for others. On the face of it, it makes no sense to use expensive agency workers… For every £1 an hour they are paid, their agency receives another £1. So in an age of austerity, why are the bosses choosing the most expensive and least effective option? 1)	No advertisement costs, cost of interviews, CRB/DBS, or any costs relating to recruitment. The agency will cover all of these. 2)	No occupational health costs. If you consider that NHS trusts have whole departments to cover the health of the workers, then every worker who is an agency employee means less spent on occupational health. 3)	Mandatory training – In the NHS all new employees would have a week of initial mandatory training (more in some areas) with updates each year. Agency workers undertake this via their agency - often unpaid. This saves the NHS money and means it can reduce the size of training departments. 4)	Insurance costs – portions of this switch across to the employers, i.e., the nursing agency, and not the NHS. 5)	Each NHS trust has a training budget (above and beyond mandatory training)… usually spent on post-grad training for nurses. Agency workers are not entitled to this - therefore the budget can be reduced. 6)	Indemnity insurance the cost and responsibility is transferred over to the agency. 7)	Human Resources departments are huge within the NHS. The greater the number of staff working in the NHS that are employed by private agencies, then less needs to be spent on HR. 8)	The NHS does not have to make flexible working arrangements for agency workers. 10)	The costs of uniforms throughout a nurses’ career will be transferred from the NHS to the agency. 11)	The NHS does not have to pay ‘sick pay’ to an agency worker (neither does the agency). When an NHS worker is off sick, then they are paying twice, as they pay for a replacement too..
12)	The NHS suspends staff on full pay, often for months at a time. Agency workers are just not rebooked. 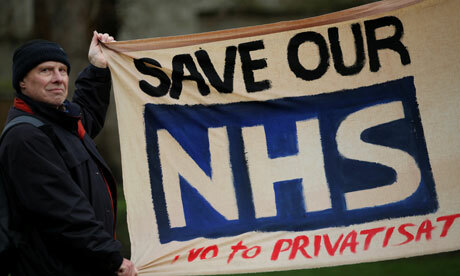 13)	NHS workers are subject to long and costly disciplinary procedures, agency workers are dealt with via the agency. 15)	The NHS does not have to provide 6 weeks paid holidays and 8 bank holidays to agency workers. This would equate to over £100,000 over the course of a nurses’ working life (assuming they work for 40 years)… NHS has to pay twice, as they need to cover shifts… Does not apply to agency workers. 17)	The NHS does not need to relocate nurses who are surplus to requirements. The can just cancel the bookings. 18)	The NHS does not have to continue to pay workers if a service is closed, and(or) until another post can be found for them. 19)	The NHS does not need to pay national insurance contributions for agency workers. 20)	The NHS does not need to provide on-going clinical/managerial supervision to agency workers, or the administration required when managing permanent staff members. 21)	Agency workers are paid a fixed rate that only rises through inflation. Nurses employed in the NHS have annual increment rises as well as inflationary pay rises. Over the course of a nurses’ career, if he/she had one promotion, they would move from one pay band to another (5-6) – across a spectrum of £14,000. This would take (on average) 10 years to achieve. This would mean that over the last 30 years of a nurses’ career they would earn £420,000 more than if they had stayed at the very bottom of the lowest registered nurse pay band…. An agency worker never leaves the bottom of that pay band – Which theoretically saves the NHS £420,000 over a nurses working life. 22)	The NHS does not pay pension contributions for agency workers. 24)	The NHS pays a ‘death in service payment’. Agency workers are not subject to this. 27) Lastly, if it was cheaper to employ permanent staff, then temporary agencies wouldn't exist in any sector. Assuming a registered nurse works in the NHS for 40 years (I will work 46 years based on projected retirement age) never reaches a management grade, and never has a day off sick, then based on my figures above, the cost of that nurse – over and above their basic salary would be £800,000…. (mainly on pensions, holidays, enhanced payments)… when you factor in the hidden/indirect costs, and maybe add in ‘average’ sickness payments, then the cost of a nurse over and above their basic salary it likely to approach £1 million. So, like-for-like, and once the agency has taken their cut – a nurse employed by the NHS will cost employers/tax-payer approximately £500,000 more following a 40 year career and 20 year retirement, than an agency employed nurse, would. Based on these figures it is clear why for over twenty years, governments of all stripes have been happy for agency bills to soar. Whilst in the short-term it may – on the surface - appear expensive, there in a long-game being played. The bosses will have you believe that agency use is ‘extra’ to a set ward staff establishment, and only used when there is increased acuity or staff sickness. This is false. Ward staffing establishments are deliberately set lower than they should be. This is to allow an almost permanent 20-40% of a wards staffing to be ‘agency’, which in turn leads to the savings listed above. Over the coming years you will see that 20-40% rise, just as it has over the last 20 years…. I am impressed with the figures and research for this article. Do you have any observations about the role of NHS chaplains employed by NHS Scotland as a further aspect of the overall theme you follow that agency work is cheaper for health boards? My approach is to seek the rationale for using full-time, well-salaried chaplains in hospitals in Scotland as a secular critique, bearing in mind your illuminating comments about the long-term 'strategy' of the apparatus to subvert the public function of the NHS in favour of private provision. Thanks for this. I take your point about the money saving device of agency use and about privatisation. However, the situation in Scotland, as you probably know, is somewhat different. Chaplaincy since the start of the new century has entrenched itself as a core clinical service established by Scottish Government fiat within the fifteen geographic NHS boards (not Trusts) that are centrally and tightly controlled. Chaplaincy is an allied health service with its own competences and capabilities and, because of the much smaller size of the NHS Scotland compared to south of the border, is effectively and paradoxically a secular developing facility within a secular greater NHS. I say "secular developing" because NHS chaplaincy here in Scotland is an emergent device being prised free from its history in a former gentleman's agreement that funding for religious chaplaincy would be half and half Church of Scotland as the "established" church and NHS money. From about the year 2000 hospital managers were directed by Executive Letters from the Scottish Government to absorb the facility completely as a salaried AHP profession, to 'nationalise' chaplains as a clinical function. The reaction of the Catholic hierarchy is instructive here in that they are hostile to this process of desacralising of their priest chaplains. As you know a priest has a sacramental function and his 'manager' is not the hospital that would employ him but his bishop. Both sides have cobbled together a temporary compromise of allowing a priest chaplain to administer only to Catholic patients but this is unlikely to last as the ethos of spiritual care (to give the service its official designation) is generic and designed as a provision for all religions and none. The obvious tension is unstable. So, with respect to your general thesis, I don't see any kind of "rent-a-chaplain" alternative building up in Scotland as a free-market supply device and cost-cutting excuse unless the centralising monolith that the SNP government has built in the NHS here is broken up by any future unionist rule post referendum settlement. My general point here is that your thesis for the other parts of the UK NHS is commendable and correct but not for Scotland. This is not to underestimate the neolib impact on the entire fabric of public services through Britain, and maybe the writing is on the wall for Scotland too...independence or no.